Long before the world of pharmacies and hospitals, civilization depended on plants to heal common health problems. It’s estimated that herbal medicine began 5,000 years ago, but it may be even more ancient than that (1). Some herbal medicine has withstood the test of time, like Traditional Chinese Medicine, which has been practiced for 3000 years and is still accepted by the Chinese medical community as a viable science. 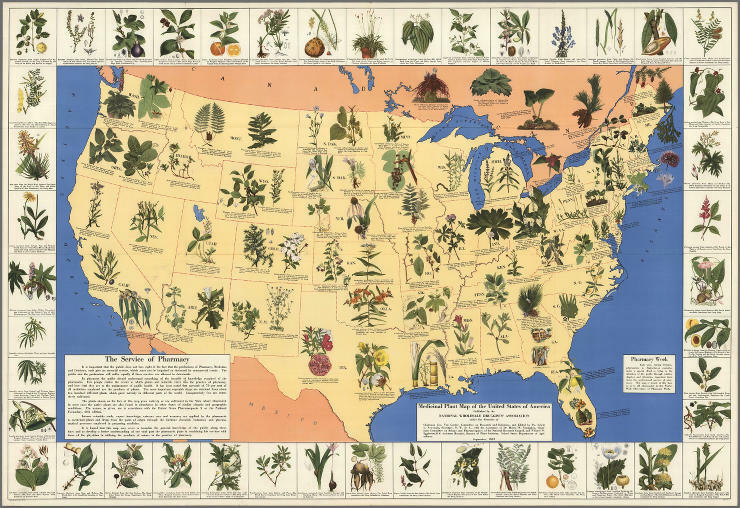 Herbal medicine also has a history in the Unites States. Native Americans carried on long-standing medical traditions and shared them with European settlers. Up until the Drug and Cosmetic Act of 1938, herbal cures were a viable method of treatment in American clinics. You can visit the map’s page on the David Rumsey Map Collection website to view a zoomable version. “It is important that the public does not lose sight of the fact that the professions of Pharmacy, Medicine, and Dentistry, each give an essential service, which must not be impaired or destroyed by commercial trends. The public and the professions will suffer equally if these services are allowed to deteriorate. In pharmacy the public should understand something of the breadth of knowledge required of the pharmacist. Few people realize the extent to which plants and minerals enter into the practice of pharmacy, and how vital they are to the maintenance of the public health. It has been stated that upwards of 70 percent of all medicines employed are plant products,” reads the left hand corner of the map. For a long time, American medicine moved from botany towards synthetic chemistry, believing that pharmaceuticals would bring better results than natural cures. This method of healing was also much more profitable for hospitals and businesses. For the last few decades, drugs have held a monopoly in the world of medicinal treatment options. However, with the rising cost of healthcare and the rise of antibiotic resistant bacteria, Americans are making a move back to their roots. The National Institute of Health estimates that 20% of the population currently use herbal products to maintain or better their health (1). 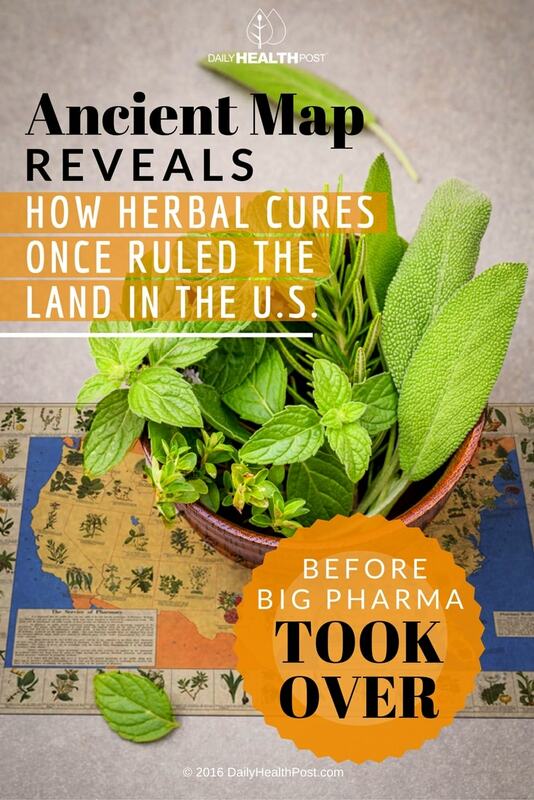 As of 2016, there are about 20,000 herbal products available in the United States but the most popular are Echinacea, Ginseng, Ginkgo, Garlic, Peppermint, Ginger, Chamomille, Kava and St-John ’s wort (1). Oddly enough, almost one fourth of pharmaceutical drugs are derived from botanicals, meaning that these plants can in fact “diagnose, cure, mitigate, treat, or prevent illness.” (4). In fact, the World Health Organization estimated that 80% of people worldwide rely on herbal cures for some part of their primary health care (4). In Europe, 70% of German physicians prescribe about 600 to 700 plant-based medicines that are recognized by the country’s health care system. Many European countries even finance research on the safety and effectiveness of various plants (4). It’s no wonder that American pharmaceutical companies are trying to get a slice of the pie. Unfortunately, a lot of the recent research going into herbal cures is doing so in the hope of isolating specific compounds to be patented and sold as a drug. However, most of the efficacy of healing foods doesn’t come from one compound, but how all the compounds and nutrients work together. If you’re interested in trying natural medicines, talk to a naturopath. Some herbs may interact with prescription medication or worsen pre-existing conditions so it’s always important to seek medical advise before use.